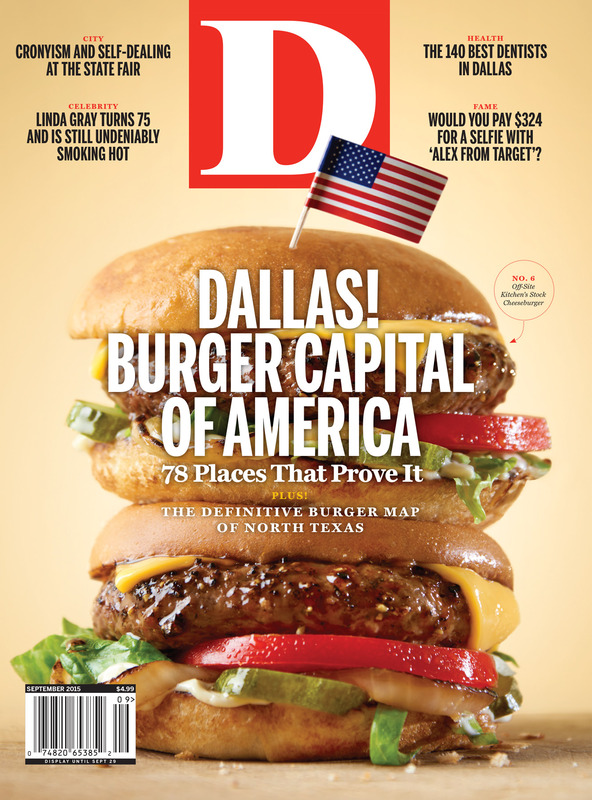 By D Magazine | 4 years ago Why our city is the burger capital of the world. By Zac Crain | 4 years ago He was a basketball superstar at SMU in the late ’80s. Then the football scandal, of all things, cut short his career. Then he didn’t get drafted. And his agent died. And his minor league team folded. Most people would have given up on the game. He can’t. By Peter Simek & Laura Wilson | 4 years ago In 1979, the Dallas photographer accompanied Richard Avedon on a journey that would produce his landmark series of photographs, In the American West. Now Wilson has her own book and a career-spanning exhibition that offers a testament to the enduring allure of the wilds that lie just outside our city limits. By Brantley Hargrove | 4 years ago The 50-year battle over Dallas’ water supply. By D Magazine | 4 years ago The top professionals to take care of your chompers. By Audrey Swanson | 4 years ago Our county now boasts one of the largest hospitals in the world. By Michael J. Mooney | 4 years ago The Plano organization has become the HQ for the defense of religious freedom. By Laura Kostelny | 4 years ago The 33-year-old Dallas lawyer smashed the 100-mile North American trail record. By Peter Simek | 4 years ago The next generation strives to keep the African-American newspaper relevant. By Eric Celeste | 4 years ago The nonprofit that runs Dallas' biggest annual event has taken advantage of the city for decades. By David Hale Smith | 4 years ago Our burger editor makes the irrefutable case. By Brian Luscher | 4 years ago Chef Brian Luscher on the Grape's double-edged success. By Mariel Street | 4 years ago My successful-restaurateur father discouraged me, but I pursued my dream of Liberty. By Richard Wingfield | 4 years ago Richard Wingfield's joint has forged a loyal following. By Catherine Downes | 4 years ago When it’s 6 a.m. and all you want is a juicy patty of meat. By David Hale Smith | 4 years ago A recent issue of Food & Wine boasted “13 Ways to Upgrade a Burger,” offering all manner of heinous crimes against beef. My advice: don’t upgrade your burger. Just make a good one. By Catherine Downes | 4 years ago We asked four unlikely suspects to make a dream come true — just this once. By Nancy Nichols | 4 years ago Now that restaurants are offering gluten-free dishes, I almost have my life back. By Eve Hill-Agnus | 4 years ago The Lowest Greenville Middle Eastern spot transports with its tastes. By Catherine Downes | 4 years ago The kitsch and the steaks make dining here a Dallas must-do. By Tara Nieuwesteeg | 4 years ago Where Plano's gray-haired set goes to act like teenagers. By Zac Crain | 4 years ago A short conversation with a Dallas icon.